I know I can't be the only one who craves fresh salads and raw veggies as soon as the weather starts to warm up. Isn't it incredible that we innately have that response to nourish ourselves with what's seasonal? I've been eating this salad for a few years now. It's one of our absolute faves. The inspiration for it came from a fellow nutritionist, Debora Palmieri, who is all about plant-based eating. I highly recommend checking out her website & following her on social media because she posts some truly beautiful meals. There is no such thing as a boring salad in our household. It boggles my mind that anyone could think that a salad is boring when there is such a wide variety of ingredients to play around with. Take a leap, stray from the traditional iceberg lettuce (hello! no nutrients), carrot, celery base and store-bought salad dressing. It's actually super simple to make your own dressing at home and so much healthier for you. 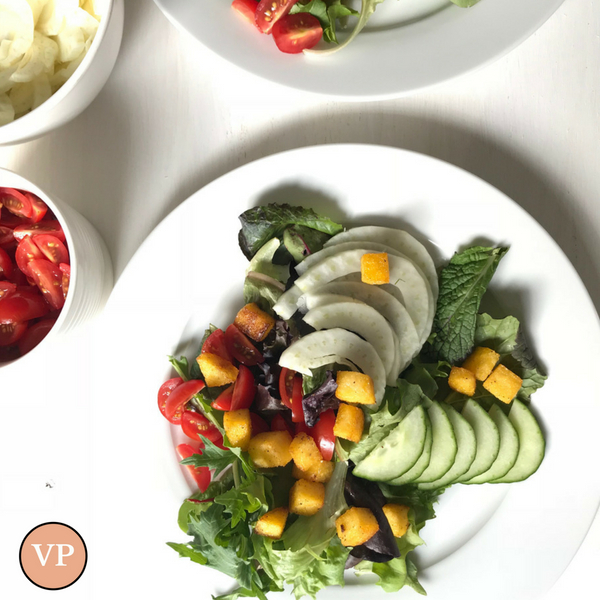 Have fun with your salads, play around with different veggies like green beans, artichoke hearts, spiral sliced beets, radishes and what's more summery than adding fresh fruit from time to time such as berries and watermelon?! When creating your salad, the trick is to add a star ingredient that really shines - something that takes it to that next level. 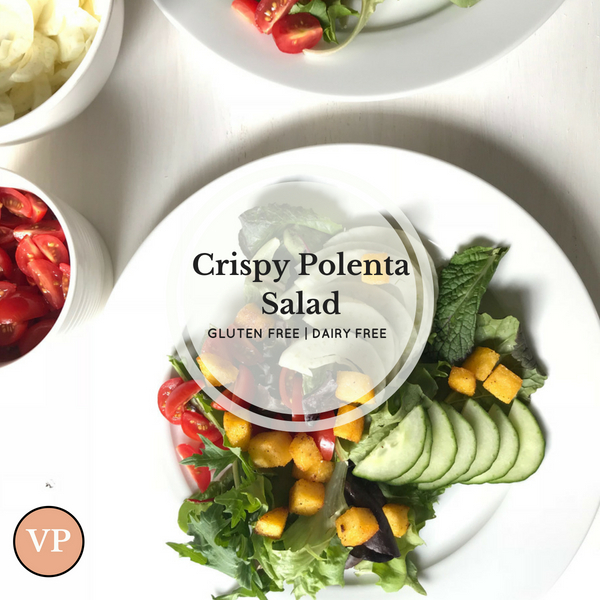 In this Crispy Polenta Salad, it goes without saying that the polenta is the star. It's the main attraction. It really is that element that tastes super sinful BUT I promise you, it's not! These little polenta bites taste deep fried (in the best way possible like french fries) but they're actually baked and then lightly broiled to get some of that beautiful caramel coloring on them. So a regular salad now becomes this mouth-watering entree with just one special ingredient. Now, we don't eat a ton of corn products but when we do we always look for organic, NON-GMO - no excuses. I highly encourage you to do the same. For the sake of simplicity, I purchase polenta that's ready-made. It should come in a tube and you can slice it or dice it up. Most grocery stores will carry ready-made polenta (again, just be sure it says NON-GMO such as Aurora brand). Preheat oven to 425F and prepare a baking sheet by lining it with parchment paper. Dice up polenta and in a large mixing bowl, toss it with 2 Tbsp extra virgin olive oil, 1/4 tsp garlic powder and a generous pinch of sea salt and fresh cracked black pepper. Spread polenta onto the baking sheet and bake for 30 minutes, flipping halfway through. Then broil on high for about 5 minutes or until just slightly browned. BE VERY CAREFUL HERE. Keep an extra close eye on the bites as you broil - they will go from caramel to burnt in no time at all. Allow them to cool slightly before adding them to your salad. In the meantime, prepare your vegetables. Portion out your greens. Slice up the cucumber, quarter the tomatoes and thinly slice the fennel. Combine everything in a large salad bowl or divide into individual portions and plate. In a small bowl, whisk together the remaining 3 Tbsp of olive oil and 2 Tbsp balsamic vinegar. Drizzle over the salad. Add crispy polenta bites to the salad and if desired, shave some fresh raw parmesan. Enjoy! Tell me, what's your favourite rockstar item to take your salad next level? Share with me below! Did you love this recipe? Share your creations with me on Instagram @valeriepiccitto. Awesome! I look forward to the opportunity to educate, inspire and motivate you towards your health goal.